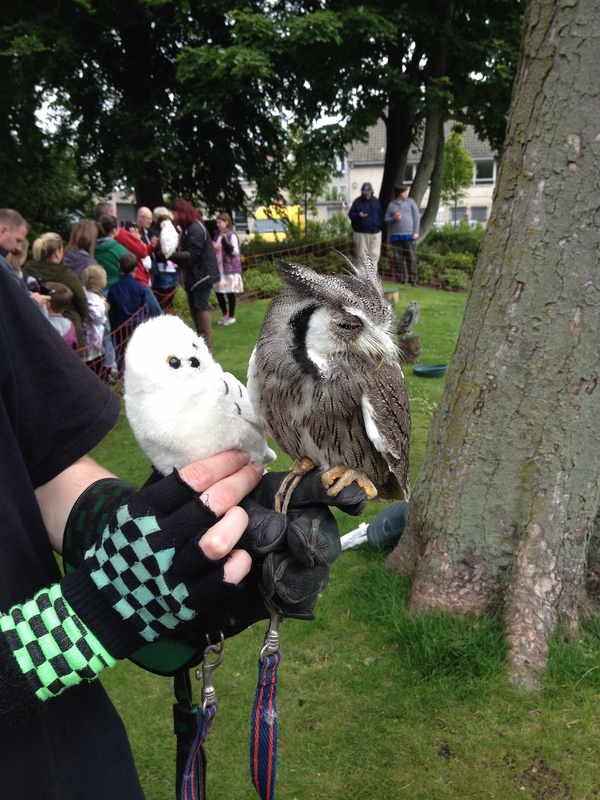 There was an event on at Duthie Park today so we went along to check it out. They had lots of gardening/wildlife/recycling stands and also some owls. The owl in this next photo is apparently Errol from Harry Potter. Elizabeth brought her own Hedwig toy along and he got to meet one of the owls. I don’t think the owl was very impressed. 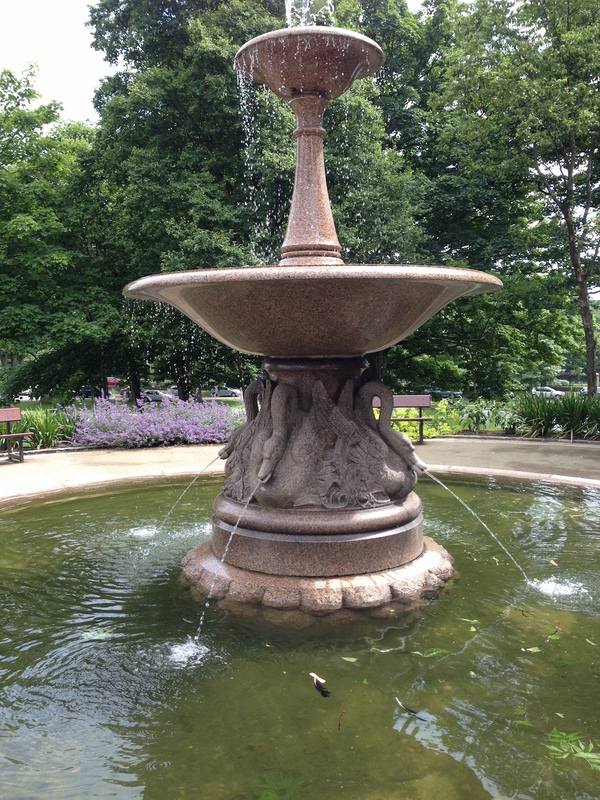 A fountain at Duthie Park. 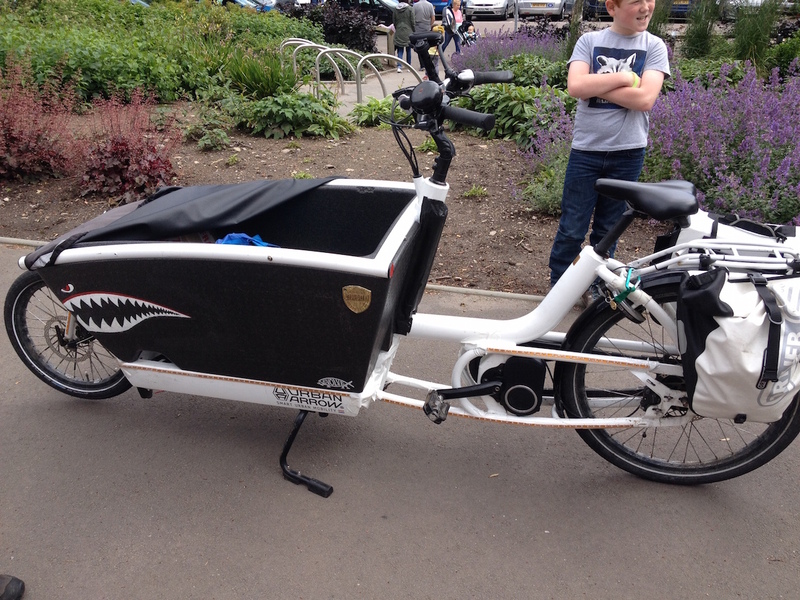 Posted in Journal and tagged 1st world problems, bicycles, cargo bikes, cycling, Duthie Park, Errol, Hedwig, owls, Urban Arrow. Bookmark the permalink. Birds of prey are amazing. Saw some at Center Parcs and their handling was telling us about the jobs they do keeping other birds away from military flight paths, etc. I agree, they are amazing. I particularly love owls for some reason. I liked the sounds they make – the hooting. Is it because you are blogging from Europe, that annoying cookies pop up every time I visit your blog? Love the owls 🙂 And quite a smart bike. btw I don’t get cookies when I visit your blog, and I’m not in Europe. What a thrill to meet real owls up close and personal. Amazing birds. Glad you are savvy enough about computers to know what Daniel was talking about when he mentioned the tragedy about the missing good ‘mod’. I suspect you were able to help him out. The only mods I can remember are certain fashionable people from the 60s. Mary Quant popularised mod fashions. I showed Daniel how to install mods because I was fed up with him asking me to do it all the time. Then he went crazy downloading a dozen mods to try out. It can be a bit hit and miss with mods with some of them not really working properly or crashing the game and I think Daniel got frustrated. A euphemism for being subjected to hoards of tourists who each want to touch him? Yes. Poor owl. They’re such beautiful creatures! 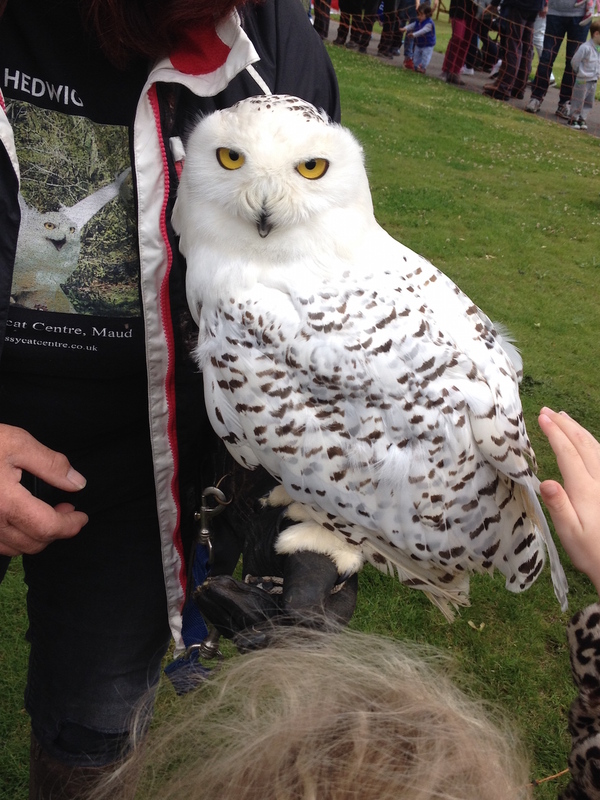 Don’t know about Hedwig, but Hedwig’s doppelganger is absolutely striking! He’s huge and beautiful, isn’t he. 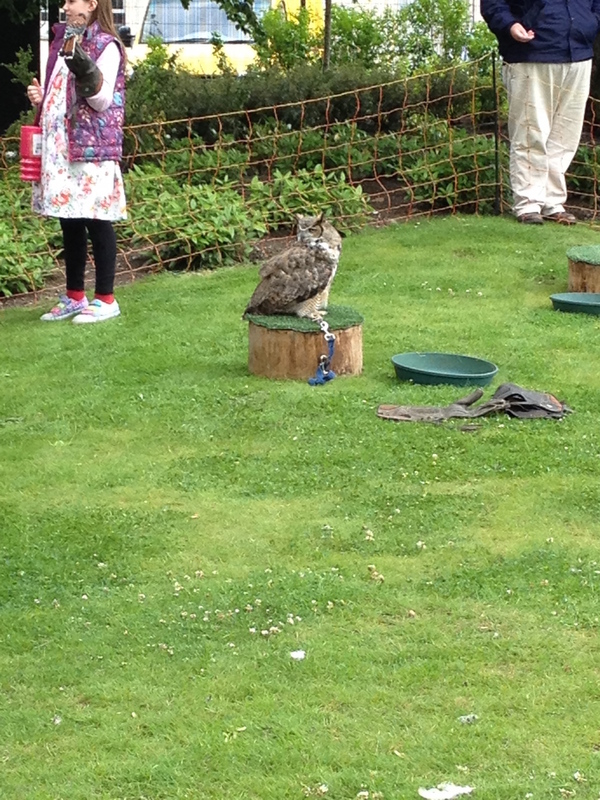 Apparently some of these larger owls can eat bunny rabbits! This may be of interest re Minecraft. Call me old-fashioned, but I think strategy board games like chess and go (especially) are better for cognitive development (and maintenance thereof in older demographics). They also allow a lot less screen time, too much of which seems to be a bad thing (I say, sitting in front of my screen). I recall your husband is a good chess player, so Daniel must have had some exposure. How did he respond? There does seem to be a go club in Aberdeen, and usually math departments will have some players around. There are a couple simplified go rule sets (capture go is one) that are suitable for young children to start with. They’re much easier to learn than chess, and like go itself allow handicapping so e.g. Daniel and Elizabeth would be able to play and have reasonably equal chances of winning. Then, after some experience with one of those, kids can easily graduate to the “big” game since only a couple added rules are involved (although on the same small 9×9 board to begin with). Speaking of go and kids, possibly this will be of interest. Thanks. I’ve never heard of Go and need some things for the kids to do. It’s school holidays here but I’m not on holiday so they need to amuse themselves during the day.